A washer dryer is ideal if you do not have enough space for a separate washing machine and tumble dryer. They have many similar features to a washing machine but with the built in benefits of being able to dry clothes as well. From size and capacity, to energy rating and spin speed, buying a washer dryer can seem like a bit of a minefield. That’s why we’ve created this short, straightforward buying guide containing all the info you need to make the right choice for your family, home and lifestyle. Look out for the ‘Our Experts Love’ range to find washer dryers that showcase the most exciting and useful features. Before buying a washer dryer these are the key features to consider. What capacity washer dryer do I need? A 5 kg machine will wash 25 t-shirts, whilst a 10 kg can wash up to 50 t-shirts. A larger capacity machine means you can wash more at once, saving time and money on energy. In terms of drying capacity, it is always less than the washing capacity as clothes condense when wet and need more room to spin while drying. Drying capacities range from 4 to 7 kg, so you may need to remove some of the laundry before drying. Some washer dryers can go from a wash cycle into a drying cycle automatically but the size of the load needs to be based on the maximum drying capacity. What spin speed should I go for? Spin speed varies from 1200 to 1600 rpm. How long is a quick wash? Quick washes take between 15 and 30 minutes for a wash cycle. Usually a reduced load size e.g. 2 kg. Designed to freshen up the load, so don't expect it to remove stains. How noisy is a washer dryer? The average volume of the machine’s wash and dry cycles, is measured in decibels (dB). The higher the dB, the noisier the machine will be. To reduce noise levels as much as possible, look for models with new technology like brushless or inverter motors, and anti-vibration systems. All washer dryers have an EU energy rating between A and C, with A rated models being the most energy efficient. Eco wash cycles use up to 60% less energy by running for longer. Also look for average water consumption per wash cycle, to help keep costs down for water usage. Look for a washer dryer which has sensor drying which switches off automatically when the clothes are dry. 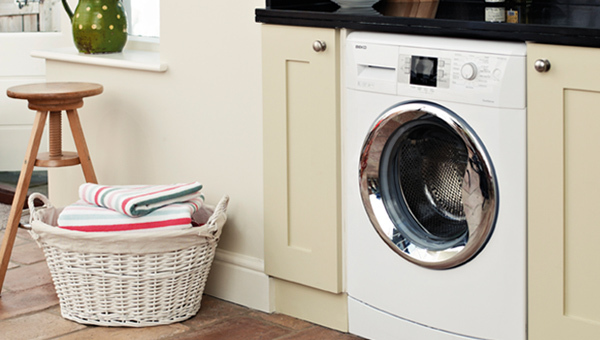 What's the difference between a freestanding and an integrated washer dryer? An integrated washer dryer (also known as built-in) sits behind a cupboard door in your kitchen. They tend to have smaller capacities than freestanding washer dryers. You’ve got more options when it comes to placing a freestanding washer dryer – they can be placed directly in your kitchen rather than behind a cupboard. You do not need to vent washer dryers. They are condensers, which means they collect water from the load being dried and remove it through a waste water pipe. This means you won’t need to empty water tanks or run hoses through your kitchen. Now you know the standard features here are additional features to consider to ensure you find your perfect washer dryer. There are lots of ways to save money from choosing economy wash options to looking out for sensor drying. What if I don't always want to fill the washer dryer to full capacity? Some washer dryers have an Auto Weight Sensor, which can automatically calculate the time needed to clean your load of laundry. How else can I economise on the wash? Economy options (or eco programs) reduce the wash temperature but extend the length of wash to compensate. How can I take the guess work out of drying so that I don’t use too much energy? Keep your eye out for machines with sensor drying – these washer dryers monitor the moisture of the load and stop once they are at the right level of dryness. Most machines have standard programmes such as cotton, synthetics and quick wash but some have special cycles to help with different types of loads. What should I look for to help with tough stains? Some machines pre-mix the detergent to improve the performance of the detergent. Intensive programs are designed to boost stain removal. Pre-wash cycles are ideal for loosening up dried-on or heavily soiled marks before the main cycle. My family are really sporty, so I wash a lot of dirty kit. An intensive or sportswear cycle will help to remove stains like grass and mud. Some machines have an option that lets you wash trainers. If you want to make clothes waterproof or more water resistant, look out for a proofing program with waterproof wash liquid. I want to do less hand washing but I have lots of delicates - what can I do? Hand wash or Delicates programs care for delicate fibres and knitwear by reducing the drum agitation during the wash and spin cycle, and wash at a lower temperature. Some of my family have sensitive skin. How can I ensure all of the detergent is removed in the wash? The extra rinse function lets you increase the number of rinses to the program, removing more excess detergent. Some washer dryers have allergen removal programs, which are great if you have an allergy sufferer in the family. It helps to remove allergens like pollen and dust mites. Baby cycles are perfect if you have a baby at home, as this adds extra rinses to wash away detergents which can irritate sensitive skin. How can I take the guess work out of drying? Some machines now offer advanced features such as sensor drying, which stops the cycle when clothes are dry. Sensor drying saves time, reduces energy consumption and avoids shrinkage. Can I go automatically from a wash program into a drying program? Some machines let you program a drying cycle to follow a wash cycle. You will need to make sure that all the clothes in the load are suitable for the drying program. There are different ways to control your washer dryer from simple dials to using your smartphone. What types of control panels are there? Most machines have LED or LCD screens that provide details about your wash. Some have indicators that provide basic information about the programs. A machine with a memory button will let you save your wash settings to use again. How can I set my washing to run at a time I want? Delay timers let you delay the start of the wash, usually by a few hours. This can be anything from 3 to 24 hours depending on the machine. Some machines have ‘end time’ functions, which let you choose when the program finishes, rather than when it starts. How can I stop my child opening the washer dryer door? The most common type of child lock disables the controls on the control panel, which will stop children from being able to change the settings or start a program. The second type of child lock is a device that stops the door from being closed, so your kids won't be able to 'accidentally' trap items such as toys, your valuables, or the cat, in the drum. How can I control my washer dryer with my smartphone? Some washer dryers have the ability to be controlled by your phone, choosing when to start the wash and see where it is in the cycle. Some allow you to download specialist programmes and diagnose problems early. The washer dryer will need to be connected to WiFi. From delivery to installation and recycling, once you've chosen your new washer dryer, we can help with all the extras. What space does a washer dryer need? A standard size washer dryer is 850 x 600 x 600 mm (H x W x D). You will need to make sure that your washer dryer will fit into the space where you would like it to go, considering the width, height and depth. Remember to allow for space for the hoses connected on the back of the appliance, and for the door to open on the front of the dryer. Why are all washer dryers cold fill only? All modern washer dryers are cold fill. It takes less energy for the washer dryer to heat the water, helping to cut down on the energy used. Starting with cold water gives better wash results when you’re using biological detergents, as the enzymes work best at low temperatures. What do I need to get my machine up and running? A cold water feed – this is for clean water to enter the machine and is a connection on the plumbing in your home. This is a round, threaded connection and will usually have a small blue valve next to it that rotates 90 degrees to turn the water supply on and off. A waste connection – this is for the used, dirty water to drain from your machine at the end of the wash cycle. This can come in two different styles - a standpipe in an upright position that should be almost has high as the washer dryer, which the waste hose on the appliance is inserted into, or a spigot which is a threaded connection and approximately 12.5 cm long. This is usually on the u-bend below a sink. A plug socket – washer dryer come with a standard 3-pin plug to power the machine and heat the water. All connections must be within 1.5 m of the machine although we will supply and use a longer cold water pipe and extension waste hose if safe to do so. Sometimes the cold water valve can get seized or corroded when not used for a long time. It is important that you check the blue valve still rotates to isolate the water supply prior to disconnecting any hoses. If there are any issues with this it is recommended that you contact a plumber to resolve. What warranty does my washer dryer come with? Most washer dryers at Currys PC World come with a minimum one or two year guarantee, but a five year guarantee is included on our range of premium washer dryer.